Acquired: Signed on July 4, 2018. 2018: Mackie appeared in 14 games where he has four defensive tackles and one quarterback sack. 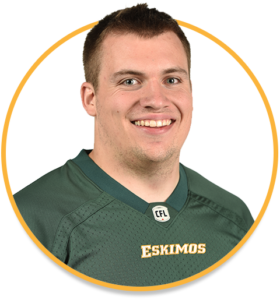 He made his CFL debut in Week four where he recorded one tackle and one quarterback sack. 2017: Selected in the eighth round (67th overall) of the 2017 CFL Draft. Mackie returned to McMaster and appeared in eight games recording 30 tackles, six quarterback sacks and one fumble recovery. College: A standout on the field and off, Mackie was the recipient of the Russ Jackson Award for his academic achievement, football skill, and citizenship.